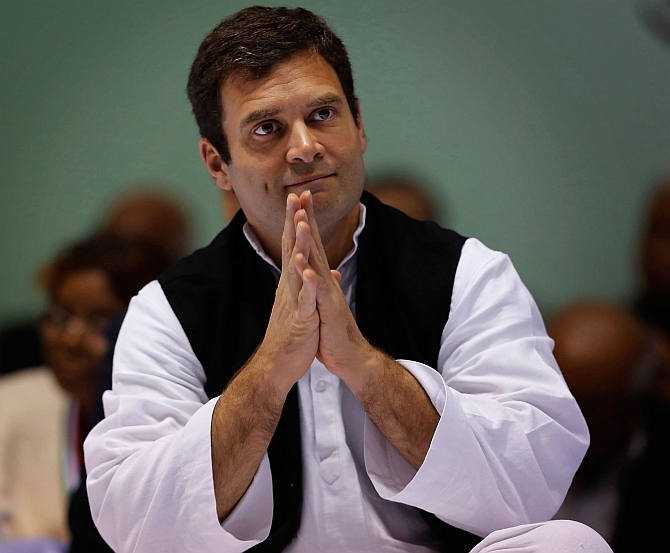 Taking a swipe at Prime Minister Narendra Modi, Congress leader Rahul Gandhi on Friday tweeted a prayer for him which asks for freedom from ignorance, a day after Modi said that BJP suffered more adversities in independent India than Congress did during British rule. "Modiji a prayer for you: "Asatoma Sadgamaya Tamasoma Jyotirgamaya Mrityorma Amritam gamaya Om shanti shanti shanti" "Lead me from ignorance to truth -- from darkness to light -- from death to immortality. Let there be peace for all living creatures," the Congress vice-president said in two tweets. Gandhi was commenting on Modi's remarks made while laying the foundation stone of a new party office in New Delhi on Thursday. Asserting that BJP has made more sacrifices than any other party, the Prime Minister had lamented that every effort of his party was seen in "bad light". "BJP will be the only party which has faced adversities since its birth. It faced difficulties at every turn and its every effort was seen in bad light. "Even during the British times, the Congress party would not have faced so much adversity that we, our dedicated workers have gone through in 50-60 years," he said at the event attended by top BJP leaders including party chief Amit Shah, L K Advani, Rajnath Singh and Arun Jaitley among others.